After the death of Saul, David officially became king of Israel. He had been anointed years earlier by the prophet Samuel, but never actually took the throne until much later. David’s first order as king was to take the city of Jerusalem from the Jebusites who occupied the city. However, the Jebusites were confident of their ability to withstand a frontal assault from David. Obviously, there was some negotiation before the battle as David tried to convince the Jebusites to surrender. It is a pretty bold statement on the part of the Jebusites. Certainly there is a lot of bravado on the battlefield — talk, fluff and pounding of chest — but in this case the writer notes this was not just talk, as the Jebusites actually believed their rhetoric. They were certain David and his army couldn’t take the city. But David did conquer Jerusalem. But he didn’t take it with a frontal assault, but according to the Biblical record actually sent men through the water tunnel or conduit (tsinnor in the Hebrew) that connected the city with its water source. Recently archaeologists have discovered there was good reason for the Jebusite’s confidence. They have uncovered the remains of an old Canaanite citadel or tower that guarded the Gihon Spring — the water source for the City of Jerusalem. On April 4, 2014, archaeologist Ronny Reich of the University of Haifa along with Eli Shukrun of Israel Antiquity Authority officially announced finding the walls of the 3,800 year old Jebusite structure. 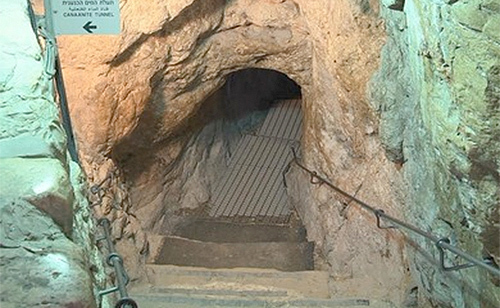 The dig had taken 15 years to complete. According to a report in the Biblical Archaeology, the citadel had “23-foot-thick walls comprised of stone blocks up to ten feet wide.” It was a formidable fortress and was the reason for the boasting. Known as the “Spring Citadel,” it’s the largest Canaanite fortress found in Israel to date. They also discovered the remains of a water tunnel that David’s men may have used to enter the city. According to Oriya Dasberg — Director of Development in the City of David — the “Spring Citadel” was built to protect Jerusalem’s valued water source from attack. Obviously, if an enemy army could cut off the water supply, the city of Jerusalem would fall quickly. The Citadel also protected the people of Jerusalem who regularly accessed the waters of the Siloam Pool. The citadel is mentioned one more time in the Biblical record, as we are told it was here King David had his son Solomon anointed the next king of Israel. As the place where Solomon was crowned king, the citadel not only marked David’s first act as King, it also marked his last. The citadel was the beginning and end of David’s kingship — his alpha and omega. Previous PostCan You Trust the Bible? Next PostIs ‘blind luck’ all that is stopping the opening of the Book of Revelation’s sixth seal?